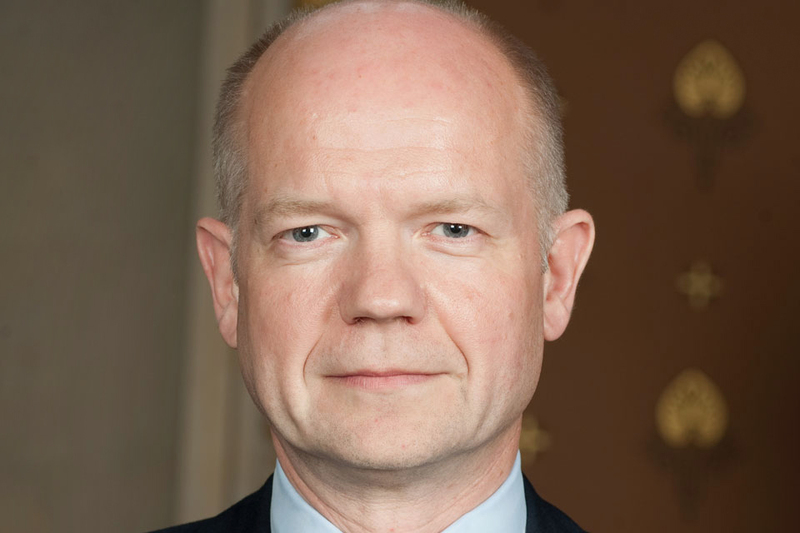 "There will be no downgrading of human rights under this Government"
Foreign Secretary William Hague addressed the launch of the Human Rights & Democracy report on 31 March. “Welcome to the Foreign Office for the launch of the 2010 Command Paper on Human Rights and Democracy, which was laid before Parliament this morning. I am pleased to see Parliamentarians from all Parties here and a wide range of representatives of civil society. This is one of many areas of public life where the efforts of Government are bolstered beyond measure by the work of people outside government. Britain is strongest in speaking out against human rights abuses when it does so with one voice. I am very pleased I am joined by two distinguished guests; Agnes Callamard from Article 19 who is also a member of my Human Rights Advisory Group, and Maziar Bahari, a journalist, playwright and filmmaker. I am sure he will not mind me noting that his courageous reporting on Iran’s 2009 Presidential elections led to him spending 118 days in prison in Iran. Iran is notorious for seeking to silence the voices of anyone brave enough to stand up for human rights, and his experience is a sobering one for us all. I thank both Agnes and Maziar for accepting my invitation to speak today. Our government promised from the outset a foreign policy that will always have support for human rights and poverty reduction at its irreducible core. And how we are seen to uphold our own values is a crucial component of our influence in the world. This is one reason why this government went to such lengths to ensure that international military operations to protect civilians in Libya have a clear legal basis, UN Security Council authorisation and wide support in the region and in the Arab world. The Libyan people have suffered serious human rights abuses for decades. Their plight at the moment is worse than ever. They are facing regime forces that have used live rounds, indiscriminate shelling and air strikes against civilians, they have endured torture, extra-judicial executions, illegal arrests and detention, and they now face shortages of food, medicine and basic supplies. Britain and its allies have intervened in Libya to save lives, to prevent a humanitarian catastrophe and to give the Libyan people a chance to determine their own future. It is action that is legal, necessary and right. We led the drive to refer Libya to the International Criminal Court and to suspend it from the UN Human Rights Council, so that those responsible for atrocities know that there will be a day of reckoning. Today, we are pressing for full and immediate access to Libya for ICC investigators and the Human Rights Council’s Commission of Inquiry. The Qadhafi regime has lost all legitimacy, and today, I renew our calls for those remaining around him to abandon him and to unite in support of a better future of their country. In that connection I can confirm, as we did last night, that the Libyan Foreign Minister, Musa Kusa, arrived at Farnborough Airport yesterday from Tunisia. He travelled here under his own free will, he said that he is resigning his post. We’re discussing this with him and we will release further details. We encourage those around Qadhafi to abandon him and embrace the better future for Libya that allows political transition and real reform, that meets the aspirations of the Libyan people. Musa Kusa is one of the most senior members of the Qadhafi regime, he has been my channel of communication to the regime in recent weeks and I’ve spoken to him several times on the telephone, most recently last Friday. His resignation shows that Qadhafi’s regime, which has already seen significant defections to the opposition, is fragmented, under pressure and crumbling from within. Qadhafi must be asking himself who will be the next to abandon him. We reiterate our call for Qadhafi to go. Musa Kusa is not being offered any immunity from British or international justice, he is voluntarily talking to British officials at the moment including members of British Embassy in Tripoli which is, of course, now based in London, and our Ambassador Richard Northern. And as I say we will release further details in due course. First, that we would work to put right some of the damage caused to Britain’s moral authority by allegations of complicity in torture and in rendition leading to torture. Within our first year in government we have set up the Gibson Inquiry into allegations of complicity in torture; we have published the guidance given to UK Intelligence Officers and Service personnel overseas; we have reached a settlement with former Guantanamo Bay detainees and are seeking the return of the last remaining British resident, Shaker Aamer; and I have set up a new Advisory Group on human rights and published the Foreign Office’s own advice about reporting allegations or concerns of alleged torture or cruel, inhuman or degrading treatment. We are not complacent - this is a continuous process and we must apply the same high standards to actions we take now as well as to actions taken by others in the past. And secondly, I promised that we would strengthen the human rights work of the Foreign Office. Today’s report makes good on that pledge. Promoting human rights is not about glossy publications but about patient hard work. So in order to focus resources on what really matters we have replaced the previous expensive human rights publication with this form of report. We have also introduced continuous online reporting on Human Rights on our website. This report covers the period from January to December 2010; since then of course, the landscape of the Middle East has already changed dramatically, so we believe our approach will be a welcome improvement in the regularity of human rights reporting. We will update the report online every three months to highlight key events in each of the featured countries of concern. Today, for example, details of abuses in Syria, Yemen and Libya are being posted on our website. So for the first time people will be able to follow, as it develops, our reporting on Human Rights and the actions we are taking. Members of the public will be able not just to read the report but to comment on it online, and to host on their own websites any sections that are of particular interest to them. Finally in terms of the improvement of our reporting, this Command Paper is more extensive than previous reports - covering 26 countries, more than ever before, as well as new ground such as the interplay between trade and human rights. It is intended not only to shine a light on human rights violations but to inform our work and shape our future policy. This is particular relevant in the Middle East and North Africa today. We believe that human rights are universal and apply to all people, of every religion, ethnicity or culture, in all places and at all times. We do not accept the argument that democracy is not right for all peoples, even though there is more than one model of democracy. The yearning for freedom and for a life free from oppression has the power to move millions to fight back for themselves and for future generations, and is one that we will always support. The torrent of change, hope and optimism flooding large parts of the Middle East today puts paid once and for all to the myth that the Arab world is the one region immune from these aspirations. Their voices must be heard. Our message to all governments of the region is that without change, legitimate grievances and demands for human rights and political freedom will not go away. If change can be achieved peacefully in the Middle East it will be the biggest advance of democratic freedoms since the collapse of communism in Eastern Europe. If it cannot, we are likely to see turmoil and unrest which sets back the cause of democracy and human rights. That is why our response to these events must be bold, ambitious and historic, in its nature and scale. For our part, we will offer assistance to those countries striving to reform, as we have done so already with Tunisia and with Egypt, and we will continue to urge the European Union to use the resources at its disposal to act as a magnet for positive change. The eyes of the world are on the Arab world today. But this must not diminish our efforts to defend human rights elsewhere, in countries flagged up by this report. Our report concludes that the human rights situation in Iran is bleaker now than at any other time in the last decade; with more executions per capita than any other country and more jailed journalists than anywhere else in the world. We continue to work hard with other countries to highlight and take action against human rights abuses in Iran. Last week, the EU announced that it will seek swiftly to impose sanctions against individuals in Iran responsible for egregious human rights abuses, and the UN created a new Special Rapporteur on human rights in Iran with our strong support. The report finds that there was no significant progress on civil and political rights in China in 2010. We remain committed to engagement with China on human rights. China has made progress on improving economic and social conditions, lifting nearly half a billion people out of poverty between 1990 and 2005. But the development of independent civil society and application of human rights under the rule of law are, in our view, essential prerequisites for China’s long-term prosperity and sustainable growth. In 2010 serious human rights violations continued in North Korea; defectors from the country paint a picture of a place where torture, inhumane treatment and severe restrictions to freedom of speech, movement and assembly are routine. In Burma, the welcome release of Aung San Suu Kyi has not led to an improvement in the human rights situation there or greater political openness. Britain played an important role in securing the toughest and most comprehensive human rights resolution on Burma to date at the UN General Assembly in November, just as we did at the UN Human Rights Council recently in agreeing a Commission of Inquiry into the recent human rights violations in Cote d’Ivoire. The inclusion of Belarus in our report is a reminder that we cannot be complacent about the human rights situation closer to home. The human rights situation there is probably the worst it has been since the breakup of the Soviet Union. After December’s flawed Presidential elections hundreds of protestors were detained including several presidential candidates. Many allege torture at the hands of the security service. The report shows that women continue to face discrimination around the world. In the Democratic Republic of Congo nearly two thirds of married women report physical or sexual abuse by their partners; in Iraq 82% of women do not work; in Saudi Arabia women may not drive and a man can refuse permission for the women in his family to study, travel or work; and in Pakistan, Human Rights Watch estimated that 90% of women are affected by some form of domestic abuse. We are committed to advancing women’s rights and to tackling violence against them. The government launched a plan earlier this month in this area, which will be supported by Lynne Featherstone, the government’s ministerial champion for tackling violence against women and girls overseas. Another worrying theme across our reporting is the continuing significant restrictions on freedom of expression - 51 reporters were kidnapped in 2010, up from 33 the previous year - and the report documents concerns restrictions to freedom of expression on the internet. This trend is likely to accelerate, given the central role the internet has played in protest movements in the Arab region. Our Foreign Office Minister with particular responsibility for human rights, Jeremy Browne, met representatives of Facebook in October and Google in November to explore what more could be done to uphold international freedom of expression on the internet. The work we do on human rights, and the manner in which we report it, matters. I pay tribute to the men and women of the Foreign and Commonwealth Office, who are in many respects standard bearers for Britain overseas. In my first ten months as Foreign Secretary I have seen their deep commitment to upholding human rights and the highest standards in their work in London and abroad. This report represents a great deal of painstaking work to uncover and document human rights concerns, to lobby the governments in question and to support Foreign Office Ministers in raising these issues. Each of the countries I have mentioned is very different, and we have to recognise that they are likely to develop at different paces. Democracy and human right rests on foundations that have to be built patiently over time, including strong institutions, responsible and accountable government. We have to work with the grain of other societies, while always standing up for universal human rights. This will continue to be our approach. It is one that is fully consistent with our efforts to strengthen links between our economy and those of the emerging economic powers, some of whom have patchy human rights records. We have to persuade such governments to change, we have to make the case that it will become ever harder for undemocratic governments to deny their people basic freedoms. We will raise our concerns about human rights wherever and whenever they arise, including with countries with whom we are seeking closer ties, and we will be a powerful advocate for British values in multilateral diplomacy and international institutions - within the European Union, the UN and the Commonwealth, and on working towards a global Arms Trade Treaty. The uprisings in the Middle East and North Africa demonstrate the huge consequences of suppressing people’s basic and fundamental rights, and are just the start of a process which will no doubt lead to similar demands elsewhere in the world. This is therefore an important hour for these issues. Over the last 60 years we have seen the end of apartheid, the fall of the Berlin Wall and the rise of democracy in Eastern Europe. All these things should give us the fortifying knowledge that change is possible, and redouble our determination. There will be no downgrading of human rights under this Government indeed there is a substantial upgrading of attention, as I have pointed out. For pursuing a foreign policy with a conscience is the right thing to do and is in the long term enlightened national interest of our country.